They did not skate with linked hands, as many skating partners did, for fear of the odd appearance being noticed; but, once they had left behind the thick crowds of sociable skaters just below the town, they skated abreast, keeping time together, stroke for stroke. There was no wind at all that afternoon, and they cut through the still air faster and faster. 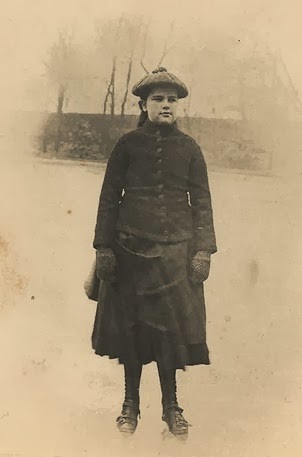 Hatty had pinned her skirt up above her ankles, for greater freedom of movement; and now she abandoned the use of her muff, the better to swing her arms in time with their skating. Their speed made the muff fly out behind her, on its cord, and at last a stroke gave it such a violent fling that the cord broke and the fur ball of the muff shot away and landed in the middle of a game of bandy and somehow became part of the game, and was never seen again. Hatty saw it disappear, and neither stopped nor faltered in her course, but only laughed, as though she cared nothing now for muffs or improprieties or aunts. They skated on. observations: I explained last week how Tom’s Midnight Garden failed to work its magic on me when I was the right age for it: this is the passage near the end of the book that started to enchant me during an adult re-read. Hatty is a Victorian young woman, Tom a child visitor from the 1950s . They have come together because of their loneliness, company for each other, not sure which of them is a ghost but each glad of someone to play with. Now they are going to skate down a frozen river for miles and miles, and the description is amazingly beautiful. We realize, as Tom doesn’t, that something is coming to an end, that his visits to her are not going on much longer; they have this last amazing day together, and Pearce’s writing reaches extraordinary heights. Finally everything comes together, and then soon afterwards, when he thinks all is lost to him, he finds out (what even child readers have guessed) who the grown-up Hatty is, making for an almost unbearably moving ending. I don’t know why I disliked the book as a child – heart of stone, head of bone perhaps? Maybe I skim-read the ending, because to be honest I still think the first half is boring and badly-structured – I’m surprised everyone makes it to the end. I know, I know, blasphemy. Anyway, totes worth it for the final quarter. The photo is from the Tyne and Wear museum. Your crystal ball proves unerringly accurate.........Wednesday then? Moira - I love that description of Hatty's clothes; so unerringly Victorian without overdoing it. And that weaving of timelines together takes a deft hand; I'm glad this ending made the whole thing work for your. That's the thing too about writing style isn't it? It can just carry the reader or along or dump the reader on the sand. Yes indeed - I found this description immensely vistual. I could see the clothes, the people, Hatty and Tom, the muff, the boys playing their game... really great writing. Moira: Now there is a girl in a sensible skating outfit who will be comfortable skating down the river. I wish I could have skated down a river when I was young but there is too much snow on Saskatchewan rivers to allow someone to skate any distance. I will also acknowledge that I am not familiar at all with the book. I have to say it's always been one of my favourites - different books, different folks! Indeed - and it has overturned my prejudices and I now do have some good things to say about it, so it must be pretty good! I love that picture. It is just perfect. The more you write about this book, the more intriguing it sounds. But it will probably still be low on my list, due to all the other piles of books I have.